The Flint area coaching carousel still spinning. On Thursday night, Tim Herman sent out a text confirming his resignation as head boys’ basketball coach at Flint Powers. Herman is stepping aside to assume more responsibilities within the organization he leads (Genesee Regional Chamber of Commerce) as they take over the local visitors bureau, an organization that formerly employed yours truly. Powers won 20 or more games in each of his first four seasons as coach, and Herman collected his 100th career coaching victory last year with a 70-34 victory over Saginaw Heritage. The Powers’ gig is a great one, for obvious reasons, and another to add to the list of vacancies in the area: Flushing, Swartz Creek, Lake Fenton, Linden, Flint Northwestern, Flint Southwestern, Burton Bentley, Lakeville, Montrose and now Powers. Lamont Torbert will probably stay on at Northwestern while Jeremy Trent is (almost) certain to take the Lake Fenton job. I would not be surprised if Powers hires internally, but that’s barely an educated guess at this point. – Started for Breaux Bridge Christian, a 62-1 team. – 1st team all-conference, 1st team Morning Sun. He averaged 14 point and nine rebounds per game as a senior. – Started and led Sparta to an 18-7 season the school’s first district title in 32 years. When John Taylor was announced as the National Player of the Year on Thursday, it probably surprised some people outside Michigan (and Danville, Illinois). Taylor was not selected by the NJCAA as its player of the week even one time during the season, confounding many basketball fans in Flint. How could a player of this caliber go unrecognized for a full season? We’ll never know. None of that matters, however, now that Taylor is officially the fourth National Player of the Year award winner at Mott. Earning Division II Player of the Year honors was Mott sophomore guard John Taylor. The Chicago-native led the Bears to a 35-1 national championship season in 2011-12. Defeating Community College of Rhode Island 70-60 in the title game, the Bears received a game-high 23 points and six assists from Taylor. On the season, Taylor ranked seventh in the nation in scoring with 24.9 points per game and led Mott with 4.1 assists per game. For his efforts, Taylor was named Tournament MVP and was a first team All-America selection. Taylor joins former Bears Jay Youngblood, Kevin Tiggs and Jeremie Simmons in the NPOY club at Mott, all players coached by Steve Schmidt who, not surprisingly, won his fourth National Coach of the Year award. Taylor’s short career at Mott has left so many wanting more. He’s about as creative (and unconventional) a basketball player as I’ve seen. He’s the best ballhandler I’ve ever seen at the JUCO level and, in a certain way, he presents the same conundrum as Tiggs did for some recruiters a few years back. Where do you play him at the next level? The best answer goes something like this: Just play him; he’s really good. In many cases “stars” aren’t fun to coach or to play with. Taylor certainly wasn’t one of these and Mott fans have another national title as evidence of the fact. 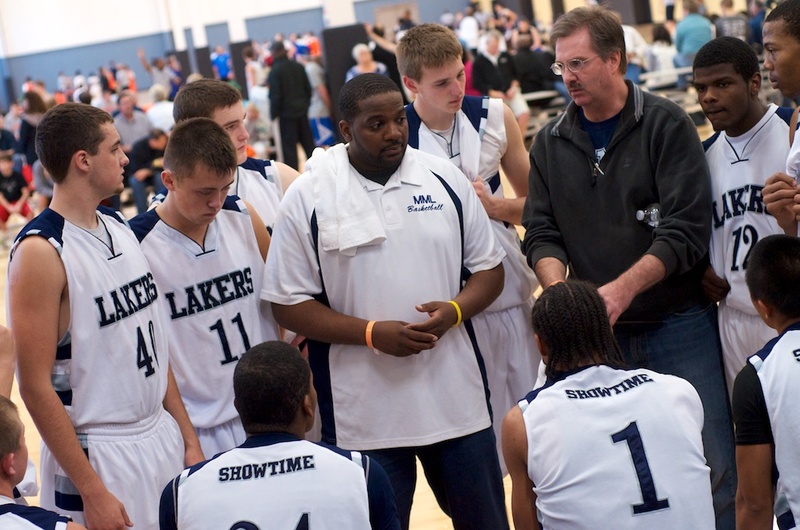 The U-17 Mid-Michigan Lakers are now 12-1 on the season after winning the tournament title at the Up North Challenge and a second place finish in the top bracket at the NCAA-certified Storm Classic in Grand Rapids. 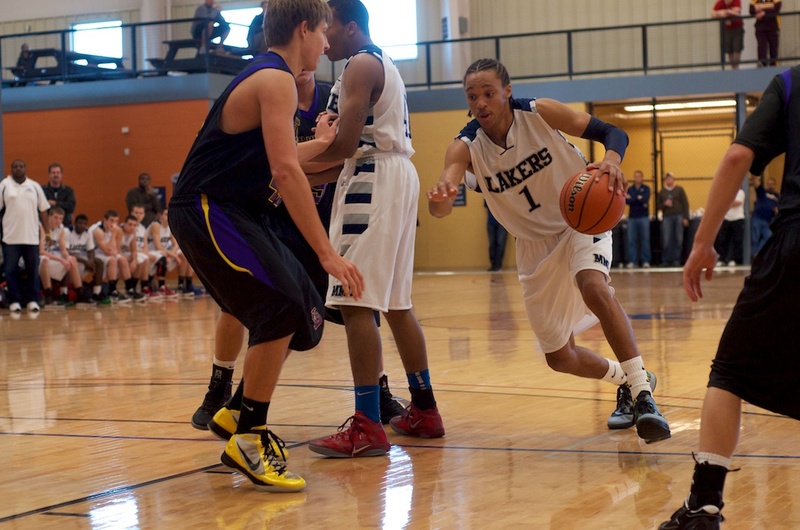 MML U-17 point guard JD Tisdale (Swartz Creek). The AAU basketball season could not have started off much better for the Mid-Michigan Lakers U-17 and lead guard JD Tisdale (Swartz Creek). The MML squad coached by Marcellus Miller (a GLH guy from way back) is 12-1 on the season with a championship at the Up North Challenge and a second place finish in the top bracket at the Storm Classic. It’s been an already amazing April for the Mid-Michigan Lakers. After winning the Up North Challenge the previous weekend in Mt. Pleasant, they made another championship game appearance despite losing Lucas. How are the Lakers this good? The easy answer is that, through years or AAU recruiting wars, they were able to hold onto 6-5 JD Tisdale. He was the most exciting prospect in the gym, the rare high school kid, like a skinny Denzel Valentine, who makes his teammates so much better. One college coach said Saturday night, he’s a three-point jumper away from the Big 10. With his current trajectory, the Swartz Creek junior will end up a top five prospect in 2013. Flint Beecher's Antuan Burks signed with Mott Community College on Thursday. One of the top guards in Mid-Michigan became a part of one of the nation’s elite JUCO basketball programs on Thursday. 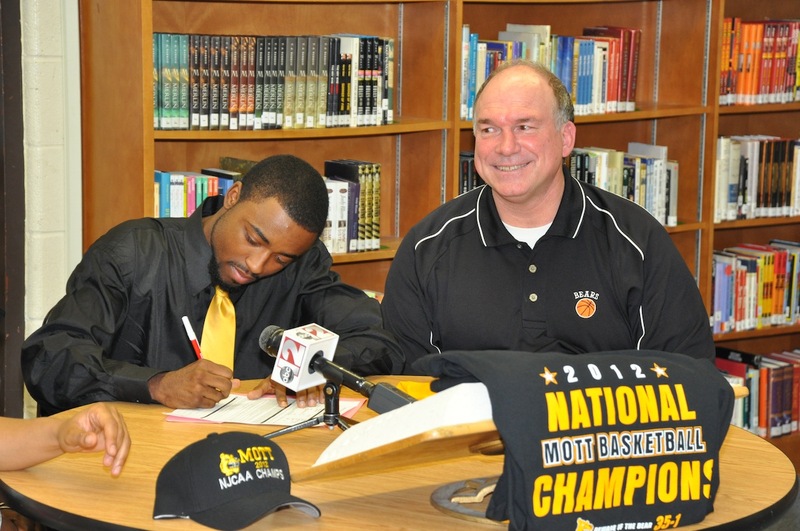 Antuan Burks, a key member of the 2012 state championship team at Flint Beecher, became the first member of the 2012-13 recruiting class at Mott Community College. Burks will fit the style of hall of fame coach Steve Schmidt perfectly. He gets after it on both ends of the floor and will fit right in to Schmidt’s aggressive defensive schemes. Burks, a two-sport star at Beecher (he’s great on the gridiron as well), scored a combined 40 points in his team’s two games in the semis and finals this season at Michigan State. Knowing Mott’s program about as well as anyone, I’m confident he will see a lot of playing time as a freshman based on his toughness alone. I predict Schmidt will love coaching this kid, and vice versa. Burks’ good fortune will continue at Mott. After spending three seasons playing alongside Monte “Man Man” Morris at Beecher, one of the top high school guards in the Midwest, Burks will have the opportunity play next to Mott’s Ralph Eason, a surefire JUCO All-American. Beecher finished 28-0 and Mott 35-1 last season. Saginaw Valley State University head men’s basketball coach Frankie Smith resigned on Monday and the job is already posted. That’s quite an impressive $5,000 salary range. Who wants it? To develop, promote and supervise all facets of the University’s Men’s Basketball program. Ensure that all relevant institutional, conference and NCAA rules and regulations are followed, including: player eligibility, recruiting efforts, financial aid, practice schedules, etc. Promote a positive academic environment and encourage all athletes to strive for academic excellence. Prepare and execute practice and game plans, strategies and alternatives which are designed to bring success to the program. Provide moral support and encouragement and ensure the safety and well-being of student athletes. Establish and maintain community contacts which enhance the program. Assist with the purchase, maintenance and inventory of uniforms and equipment. Direct and manage the recruiting efforts of the program within the financial limits of Athletic Assistance Grants. Provide supervision of program staff, including hiring, training, performance review and staff meetings. Promote in a positive manner the enhancement and growth of summer camps through recruitment, promotions, supervision and operation. Serve on committees which promote or pertain to the basketball program or student athletes. Prepare and manage the program operating budget. Work with the Strength & Conditioning Coach in designing the strength and conditioning program you want implemented for your team. Establish and maintain a positive relationship with media. Maintain appropriate communications with student athletes and parents. Assist in the planning of banquets, fund raising efforts and other activities which promote the program. Manage travel arrangements for the team. Five years of collegiate basketball coaching experience. Demonstrated ability to project a positive and professional image in pressure situations. Ability to provide leadership to student athletes and staff. Physical and mental ability to perform the essential functions of the position with or without accommodations. Remember this former LCC star? Quentin Patin has been lighting it up ever since he left Lansing. Big-time athlete. He’s now playing in, you guessed it, Mongolia. Patrick Hayes, a longtime contributor to GLH and a former colleague at The Flint Journal, has created a long-form online basketball publication that is worth checking out — BallinMichigan.com. A must-read series is the “Michigan Mr. Basketball remix.” This is a lot of fun for those of you who, like me, followed the high school game during some great years in the Detroit PSL and SVL. Some of my favorite high school players of all-time will be featured in the series (and Drew Naymick). In case you’re wondering, I still think Dion Harris was the best player in the 2003 class. Olu Famutimi was the most entertaining, though. CMU sat and watched ducks for two weeks. The only problem is they didn’t see the feet under the water. My guess is the AD at CMU is sitting around right now in a $1,000 suit with a cigar and a $15 drink telling everyone he got a former coach from the Big East at CMU. I would bet my bottom dollar Coach Schmidt is already back in the gym at Mott or on the phone trying to find a place for his sophomores that he loves a place to play next year. Success breeds success and the same goes for mediocrity. CMU just blew its chance at success and the AD is just t0o blind to see it. Mott coach Steve Schmidt expressed his pride in his team and how grateful he is to the Flint community during an event Wednesday (Photo: Patrick Hayes). There have already been a lot of words written here about Mott’s season and record-breaking fourth national championship. 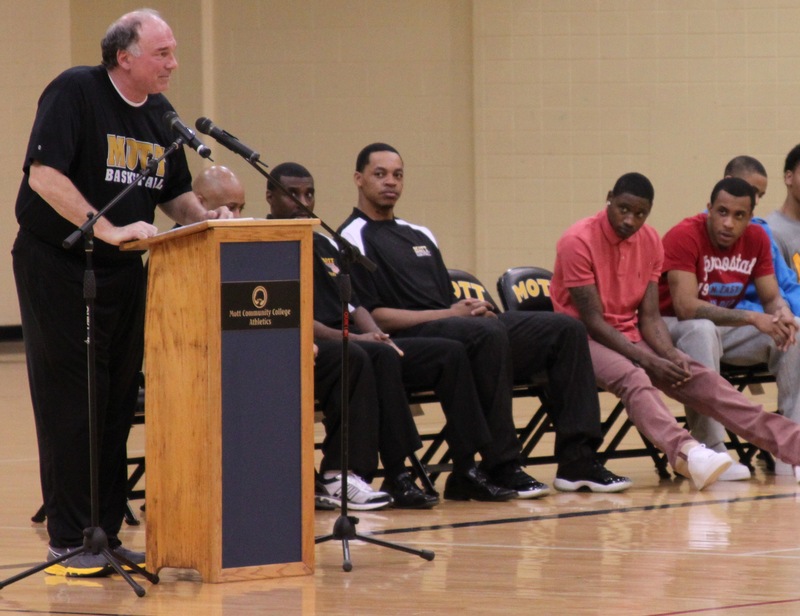 An understated, yet arguably most impressive, accomplishment was mentioned by coach Steve Schmidt during a ceremony at Ballenger Fieldhouse Wednesday: all 13 players who started the season on Mott’s roster finished the season on the roster. 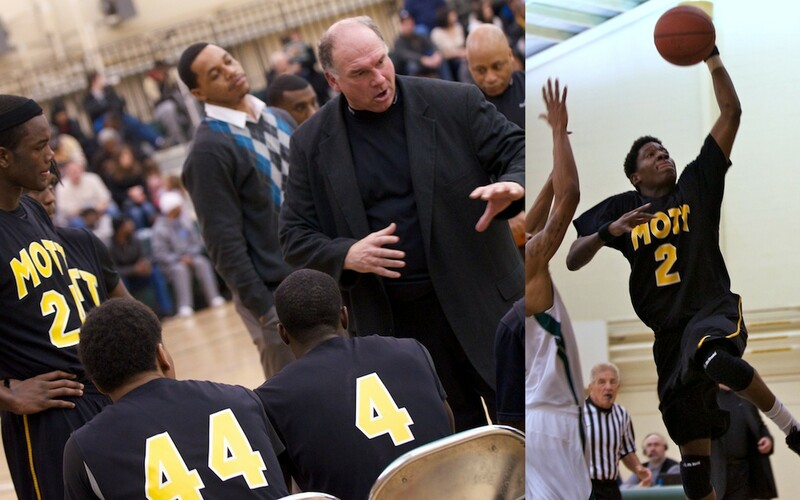 That might not sound like much, but to anyone who coaches or follows JUCO basketball closely, it’s pretty amazing. Roster turnover during the season in the JUCO ranks is generally a given. 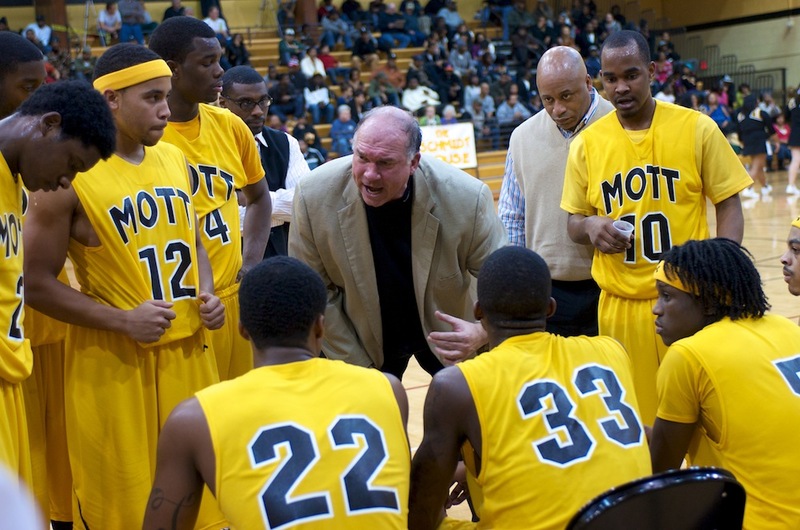 Even a program like Mott, that has an unmatched track record of success when it comes to players succeeding both on the court and in the classroom, usually loses a player or two during the course of most seasons, whether that’s a result of classroom or off-court mishaps or otherwise failing to live up to Schmidt’s admittedly high standards. That the Bears did not have a single player leave or be dismissed from the team this season is a testament to just how committed this team was in its quest for a championship. During the ceremony, Schmidt praised his players — at one time suggesting this year’s team and his former players are the ones who should have Steve Schmidt Gymnasium named after them — for their selflessness and dedication, thanked his coaching staff and the Mott administration and thanked the community for its continued support of the program. He also addressed the elephant in the room — the fact that he was a candidate for the recently filled Central Michigan University coaching vacancy. Schmidt, as he always is, was honest about his interest in Division I coaching opportunities, was honest about his candidacy for the CMU job and expressed, despite disappointment at not getting it, how much coaching at Mott means to him. The evening also featured players getting individual championship plaques and an impromptu dunk contest won by diminutive former Flint Northern guard Shaquille Smith.